The one-day festival launched in 2009 and has grown with each passing year, and is now one of the most exciting events in the rock calendar, as the streets of NW1 are given over to rock fans thronging from venue to venue in order to catch as many bands as possible. And there’s a lot of music at Camden Rocks. The 2017 edition, which takes place on Saturday June 3, features 250 bands playing in 25 different venues, including sets from The Coral, Orange Goblin, Ruts DC, Anti-Nowhere League, Royal Republic, Pulled Apart By Horses, The London SS, The Virginmarys and Turbonegro (full line-up poster below). What does Camden mean to you, and why? I lived there when I first moved to London from South Wales and spent 12 years in the area, so it still always feels a bit like home to me, or at least my London home. I had some great times there and it’s kind of where Feeder started to get noticed, so it’s a special place for sure. What can fans expect from your appearance at Camden Rocks? A good mix of Feeder classics and some new songs from The All Bright Electric album also. It should be a really fun night. What other bands should people check out at the festival? There are so many great bands playing, but definitely check out Moses, The Virginmarys, Reigning Days and Pulled Apart By Horses as they’re are all great live. Also go check out The Coral, who I really like, if you’ve never seen them live. You’re more than 20 years into your career as Feeder. Are you happy with where you are? We are in a really good place at the moment and still enjoying the ride. I still feel massively inspired to write new songs and we still love to rock out. It’s also great to see so many different ages of fans at our shows - really inspiring. There’s a new generation of Feeder fans… bring it on! Is there going to be a follow-up to All Bright Electric? We are currently recording a few new tracks and have some big plans to celebrate our 21 year anniversary since the release of ‘Swim’. Watch this space for announcements soon. We’ve just announced a really big show at Chepstow Racecourse on Aug 25th. It’s called The Homecoming as it’s where I’m from, and will become a big part of late 2017 for Feeder. Buck Rodgers: Milestone or Millstone? A bit of both… Haha! But, love it or hate it, it has become an indie rock anthem to many. 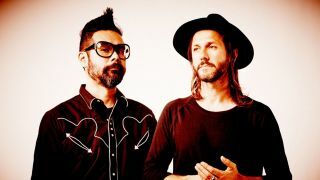 I don’t know where it came from but I guess every writer has a pop song to write and it put Feeder on the map for us. It makes people happy, so ROCK AND ROLL! Camden Rocks takes place on June 3. Tickets are on sale now.